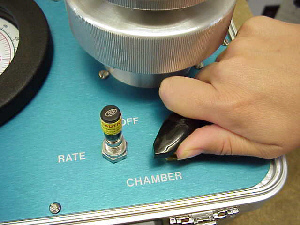 Preparing a sample for the pressure chamber usually involves removing a small lateral branch; if very small plants are used, the entire tip may be required. 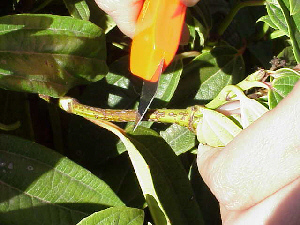 Removing the sample with a sharp knife or razor blade eliminates needless re-cutting, which can introduce considerable error in some species. The cut should be clean and normally at an angle makes for easier viewing. Because measurements should be taken as soon as possible after the sample is cut, it is advisable to take the instrument to the sampling site if possible. In many plants (especially new shoots and succulent plants) a delay in making a measurement may introduce significant error. For example, samples can be taken from dormant plants and stored for 20 minutes under cool, humid conditions before measuring with little error; however, succulent samples stored in warm, dry conditions for 20 minutes can experience an increase of 10 bar or more during that 20-minute delay. To avoid such errors, standardized measurement techniques based on sound physical and physiological principles must be used. As a general rule, a sample should be measured as soon as possible after being removed from the plant. Next you will need to seal the sample into the chamber this can be done by using a Compression Gland Cover or by using gaskets, inserts insertion tools. Click on the one that applies to you and then return to this page to finish the tutorial on “Making the Measurement”. An erroneous measurement may result if a large proportion of a small, succulent sample (e.g. conifer needle, grass blade, new shoot, etc.) is squeezed by the gasket. For example, PMS can be successfully measured with a fascicle of pine needles, but substantial (5 to 10 bar) errors can occur in measuring needles from Douglas fir, even with a very thin gasket. So long as no more than 10% of the sample protrudes through or is squeezed by the gasket, this type of error should be negligible. The control valve is turned to CHAMBER to increase the pressure inside the chamber. The cut surface of the plant sample which protrudes through the chamber cover is observed carefully. When water appears at the cut surface the control valve is turned to OFF immediately, and the pressure indicated on the gauge is recorded. The control valve is then turned to EXHAUST and when the chamber pressure reaches zero (indicated by the gauge), the chamber cover and sample can be removed. The instrument is ready for the next measurement. The endpoint, or pressure at which water appears on the cut surface, is sometimes difficult to recognize. A bright light directed on the cut surface is probably the most important aid in recognizing the endpoint. A good quality hand lens (about 10 power) may also be useful, particularly for samples which are small in diameter. When the endpoint is determined and nitrogen turned off with the control valve, there is a slight decrease in pressure even if there is no leak. This phenomenon is particularly noticeable at high stress levels with a rapid rate of pressure increase. It is caused by temperature changes inside the chamber and can be minimized by adjusting the rate of pressure increase. Resin can obscure the endpoint and may be bothersome in certain species, particularly with pines. Resin forms bubbles which break and can be wiped away to allow observation of the true endpoint. 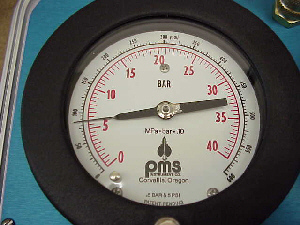 Resin usually appears at very low pressures and need not interfere with accurate measurements. With experience, resin can be dealt with satisfactorily. Never place any part of your body directly over the chamber when the chamber is pressurized. It is possible that the sample may be forced out of the chamber at high velocity!